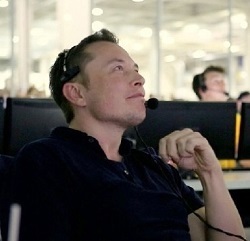 Elon Musk’s SpaceX has applied for permission from the Federal Communications Commission (FCC) to operate up to one million Earth stations to serve its Starlink constellation of 4,425 Ku- and Ka-band communications satellites it plans to begin launching later this year. “These user terminals employ advanced phased-array beam-forming and digital processing technologies to make highly efficient use of Ku-band spectrum resources by supporting highly directive, steered antenna beams that track the system’s low-Earth orbit satellites,” SpaceX said in its application. The Earth stations would be deployed in the contiguous United States, Alaska, Hawaii, Puerto Rico, and the U.S. Virgin Islands, “including areas underserved or currently unserved by existing networks,” the company wrote. “As the Commission has recognized, many communities across the United States and the world still lack access to reliable broadband connectivity, preventing them from fully participating in economic, social, and civic activities,” the application stated. “To help close this digital divide, SpaceX is designing, constructing, and deploying an innovative, cost-effective and spectrum-efficient satellite system capable of delivering robust broadband service to customers around the world. SpaceX has already secured U.S. authority for the space station components of its NGSO [non-geosynchronous orbit] system,” the document said. Rumors swirling that some number of launches (up to 4 or so) might be added to the manifest to loft the first block of Starlink birds this year. This will also be where SpaceX demonstrates sub-month (if not sub-week) turnaround of Block 5 boosters. Indeed, circular dependency is a beautiful thing. Like a free lunch to bootstrap the Startship program. Hey, why would Boeing be fixing a non-broken airplane? Asking for a friend. Space station components? He is going to build a space station? He did not say ISS. I don’t see why he would need anything from ISS. And hundreds of thousands of Teslas worldwide to network using the Starlink. Yep, he might just beat the RLV trap. Not surprised. He has the engine needed and the experience of the Falcon family to build on. But he is going to find he will need a better place to operate them from as the Cape’s ancient and limited infrastructure is already creating launch jams. It will be a long time, if ever, Teslas use Starlink as you would need to burry a pizza box sized phased array into the roof. First customers will be service providers doing backhaul. They can afford to walk the steeper part of the CPE cost curve. Then will be opened to fixed end users and only last to mobile vehicles. There is big blurry line between your characterization and human factors in cockpit and automation design, especially if training materials omitted pertinent information. But fanbois will be fanbois. the actions are the same for all. You are forgeting how those Teslas are getting their software updates. It’s not on the road, its at home in their garages. Na, just a WifI hotspot at that point, nothing unique. Yes there can be some bundling arrangement with car and home internet but that seems like a stretch. I love how the test pilot is arguing for the lack of belt AND suspenders here. You mean like selling the Tesla owners solar panels so they are using clean energy for charging them up? Ha, I am not arguing against a common mitigation procedure for multiple issues, we deal with that all the time in my business. 1) Pilot knowledge on the possible ways the system can operate equates to converging on faster situational awareness. Pointing out the augmentation to speed trim may have helped pilots arrive at situational awareness faster in this case. 2) If the software knows the AoA is spurious (by definition one side is) that could be a cue to disable the automation in this particular case yes that may not apply to all cases where trim needs to be cut off but looks like it did in this case…belt and suspenders. looks like it did in this case…belt and suspenders. these are called “comparator lights” they are right in front of the captain. Boca Chica is on the Gulf and Elon already has friends in the off-shore drilling services community – he’s leasing most of his SpaceX Navy from them. I’m sure “Here’s my situation; any ideas?” discussions have been underway for some time on the down-low. One reason Texans wear such big hats is to keep more stuff under them. The only long-term fix for that is straight replacement of pilots with AI. no need to declare victory, it never was close for you 🙂 you simply dont know what you are talking about. I would guess that they will keep doing more than 4. They have over 12,000 sats to put up there. In addition, the faster they can get a minimum of them up there that allows a region to start their internet, the better it will be for them. Yea, it’s a balance. If you are putting up that many birds and an infant mortality issue sneaks in you’ve got problems. So best to put up the early batch is smaller numbers and eval for a while.